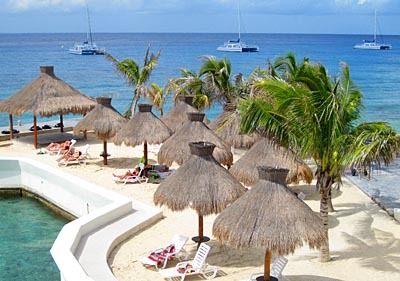 Long a divers' favorite, the Casa del Mar offers oceanside value, a great swimming pool, and at its beachclub, easy entry and exit for shore diving. Juan Leca's Dive House is now the in-house dive operator. 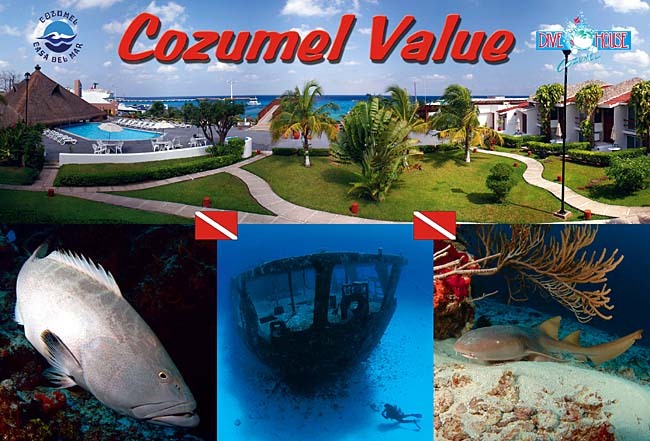 They provide two boat dives per day, plus complimentary shore tanks. The rates below are based on Superior room. Anne and I are back from our Cozumel dive trip and I want to thank you for putting another great dive vacation together for us. Casa Del Mar was very nice. It was clean, quiet, and the hotel staff was very nice. It really looks like a hotel that caters to divers. Dive House once again showed us some great diving. Thank you for all your help. 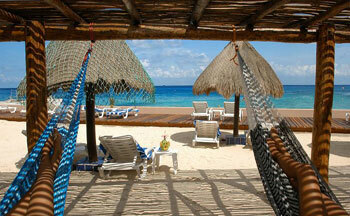 Dive House at Casa del Mar -- Juan Leca's Dive House now has a dive location at Casa del Mar. This is excellent news, as Dive House has superior boats and a highly trained professional staff to serve all of your diving needs, from shore tanks and Nitrox fills to top-quality boat diving and full scuba certification and advanced courses. 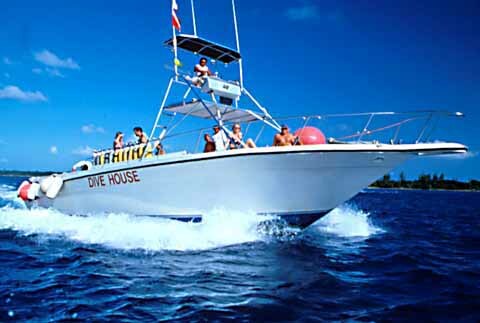 Dive House will accommodate you on a custom dive boat, teamed up with fellow divers of equal skill level. You will be served by divemasters and crew specifically trained to serve you safe and fun scuba diving. Meal Plan Available. 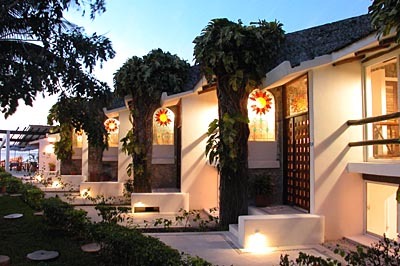 Add 3-meals daily for only $50 per person per night -- The package prices below include lodging and taxes, but do not include meals. You may add a meal plan offering three-daily meals at the additional cost of $50 per person per night. This price includes the 19% tax. Meals are available from 7 am to 11 pm. Program includes breakfast, lunch, dinner, snacks, alcoholic and non alcoholic beverages. It does not include gratuities. Guest are encouraged to tip when they receive good service. Nor does the meal plan include big shrimp or lobster dishes. These are available for an extra $15 USD per serving. If you would like to purchase a meal plan with your Casa del Mar stay, just give Island Dreams a call. Or just add daily Breakfast Buffet -- Add breakfast to your package for $11.50 per person per day. That price includes the 19% tax.